A full day of hoops commenced on the city of Minneapolis as the NY2LA Spring Extravaganza took over Hopkins High School and some of the surrounding high schools throughout the region. With a boatload of top Midwest talent on display, hundreds of college coaches from every level took use of the open evaluation period to set eyes on spotlight performers on Saturday, along the likes of Carte'are Gordon, Courtney Ramey, and Javonni Bickham. There just aren’t many guys around that have the size of Gordon yet the super nimble feet in the lane on spin moves, unbelievable hands on catches and boards, and can even turn and face in hitting the short corner jumper. The Missouri native had it all clicking on Saturday as he helped lead his team to three wins and on the last game of the night at Hopkins High, nailed a scooping lay in at the buzzer to win it for his squad. With loads of talent and a strong physique, Gordon is a sure-fire high-major big come the 2018 class. Not to be out done by his teammate down low, Ramey was unbelievable all day on Saturday. He is an elite distributor off the bounce as he finds teammates on drive and kicks and drive and dump offs, and his feel for the game at such a young age is remarkable. While he has still yet to fill out into his body, the Webster Groves guard isn’t afraid of added contact on the floor and is a high end perimeter rebounder of the ball, especially on the offensive end. As his body matures, so should his game and with it, Ramey has the looks of a highly coveted recruit over the next few years. Bickham, playing a year up on the 16-under circuit, was productive all day long. While he is a bit in between spots on the floor, the Minnesota native makes up for it with his 7’0 wingspan and high end motor. He can score through the contact at the basket and also hit the mid-range jumper off the catch. Bickham is productive on the glass as he competes with two hands and quality intensity and if he can grow a tad bit more, the freshman forward could see his lone offer from Memphis blossom into a handful of ones from all across the nation. 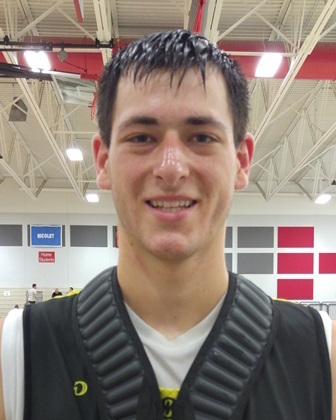 Kriener put on the full arsenal on display Saturday as the big bodied center does a great job of scoring down low with either hand off of counter moves in the post, and has the IQ to make the proper cut following the pass from the high elbow or off the perimeter for the catch and lay in. He is tough, deceptively skilled, and never stops playing hard. Throw in his quality grades and 7’2 wingspan, and it wouldn’t be surprising to see a Big 10 program finally jump in with an offer to the Iowa native. 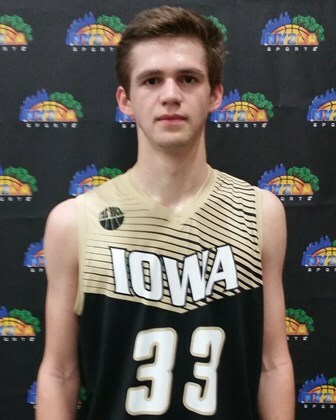 The younger brother of Wyatt Lohaus, a freshman at Northern Iowa, the younger sibling more than has his own talent in the cupboard as the Barnstormers wing was nifty on scores in the lane and intellectual reads and reactions off the face-up. With a lanky body type, Lohaus is tough off the deck and has great, nimble feet in the lane on the crafty finish as he can convert the and-1 chance. He was the primary reason his squad was able to make it to Championship Sunday and is a valuable mid-major recruit throughout the Midwest this summer. While Goss doesn’t have a defined skillset in the frontcourt, you have to love his utility, glue-like qualities. With a long and light body, Goss is capable of making plays from in and out of his area. Whether it is corralling offensive rebounds or using his length and instincts for chase down shot blocks, Goss is always about the next play on the hardwood. Finding the right home and fit is definitely a need and the Celtics prospect would be best served at the more high-tempo systems, but with need for length and versatility always in stow, expect for Goss’ name and stock to continue to escalate in the coming months. As you sit in the gym for consecutive weekends for hours at a time, you quickly learn that facilitating, tough, and figurehead point guards are hard to come by. With the need quite evidently clear for this lacking type of a floor general, Trevor Anderson was a highly talked about name on the college side of the courts at Hopkins High on Saturday. He doesn’t take any plays off, can score it and distribute whenever the time is needed, and Anderson is a productive perimeter rebounder from the 1. With just a few offers in hand, expect for the Stevens Point guard to gather in a handful more before the month of July commences. 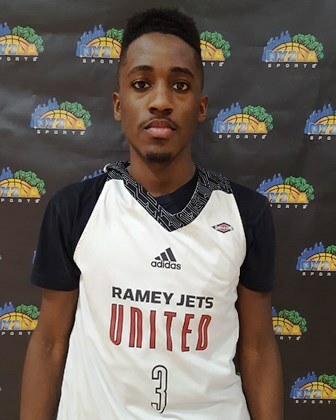 Bassey is the catalyst for his Colorado Elite group as the strong and tough wing practically does it all for his Colorado-based unit. He can facilitate for others on drive and kicks, can score through the body at the basket, and makes great track down blocks out on the break. Holding a 3.9 GPA with the books, Harvard did a tremendous job of picking up the sleeper from the Rocky Mountains as Bassey verballed to the Ivy League program last month and he smells like an all-glue man guy from a mile away! The middle Finke brother, Nick might be in between spots on the floor and not graced with great athleticism or size, but he makes up for it with just how hard he plays. He can secure rebounds from out of his area and within traffic and the lefty can also step outside and extend the defense with the deep ball. The proper system in college is a must but attempting to qualify won’t be an issue as he holds a 3.97 GPA in the classroom. While he recently came to the States two years ago from Nigeria and just began playing upon hitting his new home in Missouri, Ndu has all of the physical tools and the motor in line to be a quality recruit in 2017. He still is super raw and lacks a ton of confidence on the offensive end and especially around the bucket, but he does have a 7’5 wingspan, a quality motor, and exchanges ends of the floor like a 6’4 wing. With further time on the floor, Ndu should be able to mature his offensive skillset further and entangle himself with quality scholarship offers. While he does play third fiddle on his loaded 15-under Ramey squad, Watson does have all of the qualities to be a high end recruit in 2018. Blessed with great size and lateral skills, the Whitfield product led his team in scoring this past school season and was the only freshman in Missouri to make the all-state team. He can score it in a variety of ways, whether it is in the lane on hard drives to the rim, or off the catch as he spots up nicely off of it. Further physical maturation is key but with early looks from SIU, Illinois, Creighton, and Dayton, expect for that early interest to turn into offers with the proper progressions. With an older brother on the squad at Illinois, Finke brings great promise in his own right. While he has long arms, big hands and feet, and a quality skillset for such an early age, if the Irish prospect can grow another few inches and become a face-up 4, then he himself has a chance to be a high-major recruit. Finke already has great instincts and a fine motor in mixing it up on the interior and is capable of hitting off the catch every now and again. Give the Champaign native some time and Finke could be a highly monitored forward in 2018. While Moore’s squad went down in defeat on Saturday night, the Missouri native showed off his wealth of long term abilities and versatility in the backcourt. With great size out top, Moore can make others better on dishes from the perimeter, drive and kicks in the lane, and if not guarded heavily, score it at the rack with nice body control off his feet. With a few offers already in hand, expect for Moore to become a highly watched recruit by those within the Missouri Valley this July. Courtney Ramey already holds offers from Missouri, Illinois, Wake Forest, Jacksonville State, and SIU. Elyjah Goss carries a lone offer from Western Illinois. 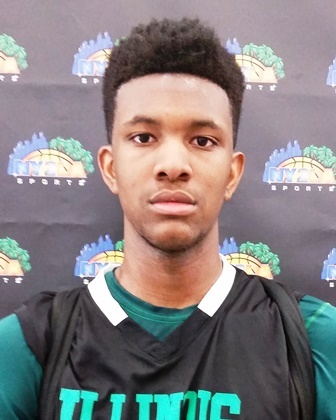 Javonni Bickham holds an offer from Memphis. Zeke Moore mentioned offers from Indiana State, Illinois State, Drake, SIU, WIU, UMKC, and Jacksonville State.